Indonesia, the 4th largest country in the world by population, is a work in progress. Corruption is still rampant, but the citizens are flexible, intelligent, and slowly pushing for change. Since it’s still difficult to create a business in Indonesia we created this guide to help foreigners navigate the confusing bureaucracy. If you’ve been thinking about starting a business in Indonesia, the Wood Egg Indonesia startup guide will be your go-to reference manual. Each year we hire 3 researchers (at least one local and one foreigner who live in Indonesia), a native English-speaking in-country writer, and an editor, to bring you insights from multiple perspectives. All of this along with hundreds of other insights. All told you’ll get the painstakingly researched answers to over 200 questions (over 300 pages!) 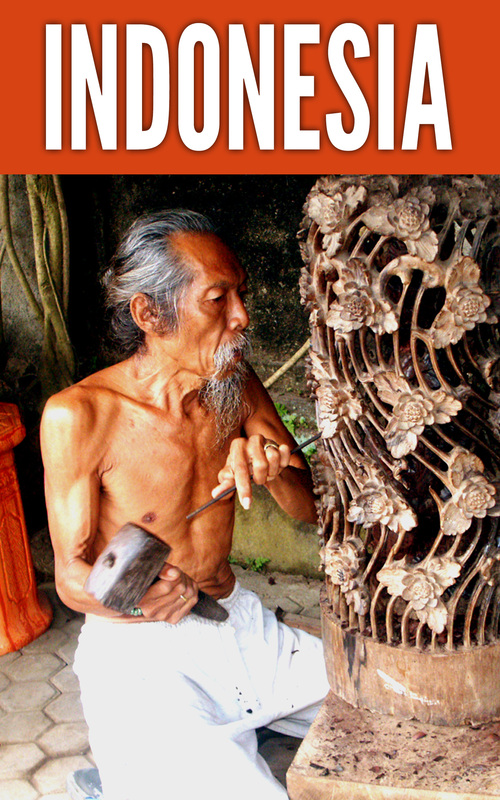 about country, culture, life, and business in Indonesia. If you’re looking to do business in Indonesia you won’t find a more complete, up-to-date, guide. Click one of the “buy now” links, above, to buy it at LeanPub, Amazon, or Apple iBooks. What is the size of Indonesia in square km? What is the distance (in km) from east to west? What is the distance (in km) from north to south? What is the total population of Indonesia? What are the top ethnic groups and religions as a percentage of population? What are the economic statistics of Indonesia? Gross domestic product (GDP)? Average income per-person? National debt? Growth percentage of last two years? Give a short modern history of Indonesia - just enough for basic conversational knowledge and context. Give a short history of Indonesia’s last 5 years, focusing on aspects that would affect small business owners. How has the recent history of the country affected people in terms of their living and business environment? Give an overview of the current 2014 political, societal, and economic condition of Indonesia, focusing on aspects that would affect small business owners. What social changes in Indonesia seem very likely in the next five years? What economic changes in Indonesia seem very likely in the next five years? What political changes in Indonesia seem very likely in the next five years? What is Indonesia’s relationship with Cambodia? Cooperative or competitive? Similarities or differences? What is the main trade between the two? What is Indonesia’s relationship with Malaysia? Cooperative or competitive? Similarities or differences? What is the main trade between the two? What is Indonesia’s relationship with Myanmar? Cooperative or competitive? Similarities or differences? What is the main trade between the two? What is Indonesia’s relationship with Philippines? Cooperative or competitive? Similarities or differences? What is the main trade between the two? What is Indonesia’s relationship with Singapore? Cooperative or competitive? Similarities or differences? What is the main trade between the two? What is Indonesia’s relationship with Thailand? Cooperative or competitive? Similarities or differences? What is the main trade between the two? What is Indonesia’s relationship with Vietnam? Cooperative or competitive? Similarities or differences? What is the main trade between the two? What is Indonesia’s relationship with China? Cooperative or competitive? Similarities or differences? What is the main trade between the two? What is Indonesia’s relationship with India? Cooperative or competitive? Similarities or differences? What is the main trade between the two? What is Indonesia’s relationship with Australia? Cooperative or competitive? Similarities or differences? What is the main trade between the two? What is Indonesia’s relationship with the United States? Cooperative or competitive? Similarities or differences? What is the main trade between the two? What are some of the major internal conflicts that Indonesia is going through now? (Between political parties, age generations, demographics, ideologies, etc.) Summarize each side’s argument. Is it taboo to talk about Indonesia’s government? How would you describe the views of the general public about the government of Indonesia? What role does religion play in day-to-day life? Are there any types of businesses that are not welcome or looked down upon due to religious reasons? How does religion affect business dealings? Times or days when people do not do business for religious reasons? Any religious rituals that businesses follow? What basic cultural norms do you think foreigners should know about working with people in Asia in general? What basic cultural norms do you think foreigners should know about working with people in Indonesia, as compared to Asia in general? What are some of the most common mannerisms when meeting with people? As compared to American individualism, Indonesia is more of a community/group-focused culture. Describe these differences from a local point of view. What are the cultural differences between people in Indonesia and Cambodia? What are the cultural differences between people in Indonesia and China? What are the cultural differences between people in Indonesia and India? What are the cultural differences between people in Indonesia and Malaysia? What are the cultural differences between people in Indonesia and Myanmar? What are the cultural differences between people in Indonesia and Philippines? What are the cultural differences between people in Indonesia and Singapore? What are the cultural differences between people in Indonesia and Thailand? What are the cultural differences between people in Indonesia and Vietnam? What are the cultural differences between people in Indonesia and the United States? How do people view foreign tourists in Indonesia? What is the common opinion about foreign workers, coming to Indonesia to work? Is it a business threat? Is it a cultural threat? What is the common opinion about foreign entrepreneurs, coming to Indonesia to set up a business? Which foreigners are generally most welcome? Which foreigners are generally least welcome? What is the most appropriate business/meeting clothing for men in Indonesia? What would be considered too casual or disrespectful? What is the most appropriate business/meeting clothing for women in Indonesia? What would be considered too casual or disrespectful? How can you tell by their clothing that someone is high-status or low-status? What is the Indonesia attitude towards punctuality? For example, if two people agreed on an 11:00 business meeting, what time range to arrive would be considered acceptable? What is considered late? What is the Indonesia attitude towards promises? Are you expected to stick to your promise, no matter what? Or is it common to change your mind? What is a common Indonesia expression that a foreigner might not understand? How can a foreigner blend in to Indonesia? What advice would you give foreigners on how not to stick out so much? How can a foreigner become a part of the business community in Indonesia? What is a good way to meet many people and make connections? Is it best for a foreigner doing business in Indonesia to blend in? Or is there an advantage to not blending in? What books, magazines, newspapers, or websites would you recommend a foreign entrepreneur read to better understand Indonesia and its business environment? Describe the general quality of life in Indonesia (Utilities, cleanliness, safety, amenities, physical comfort.) If very different in different areas, describe each separately. Which parts of Indonesia have the nicest quality of life? Which parts have the worst? Describe each. What is the average cost of rent for a 1-bedroom (unfurnished) apartment? What is the average cost for an unfurnished small house (or large apartment) for a 5-person family? What would it cost per-month for one person to live a nice, but not luxurious, life in Indonesia? Include food, utilities, transportation. What length of time is a usual contract when renting an apartment or house? What safety precautions would you recommend for a foreigner? Do most people in the cities of Indonesia speak English? If someone came to Indonesia only speaking English, how difficult would it be to live and work? Is it common for merchants to charge foreigners more if they speak in English? Which parts of Indonesia are safest? Which parts are unsafe? Describe each. How do people in Indonesia deal with petty crimes like theft? How can one generally distinguish friend from foe? Any signs to consider, or scams to beware of? How can a foreign entrepreneur live and work in Indonesia for a few years? Do they need a work visa, investor visa, tourist visa, or something else? How can someone get a visa to live in Indonesia long-term? What are some serviced apartments or furnished homes in the business district that can be rented month-by-month, for short-term (say 3 month) visits? Give examples and prices. Where should someone live to be in the middle of the most business, the most action, and to meet the most people? What specific neighborhoods? Where should someone live to be near to the business action, but to be a little outside, in a neighborhood that’s better for children? What are some places a foreigner should not stay, because of their lack of proximity, safety, or other reasons? What is a typical living arrangement in Indonesia? Do most people live in houses or apartments? Do families usually live together with parents, grandparents, kids, and siblings - or do they tend to live separately? What are the most popular mobile phone/data providers in Indonesia? Which one would you recommend? How much does it cost for a basic broadband (cable/fiber) internet connection in a home or office? Name speeds and prices. How much does it cost for a mobile data plan (3G) for heavy internet use through a mobile phone? Describe the current best plans. What’s the typical cuisine of Indonesia? Is it easy to find western food? Are there western restaurants? Western food in supermarkets? What’s the etiquette of using your hands or utensils for eating? Any inappropriate manners that foreigners often have? How do most people pay for things? Cash? Credit card? Check? Something else? What is the easiest way to get cash in Indonesia? Are ATMs the best option? What goods and services that Western people are used to are not available in Indonesia? What’s the difference in customer service between US/Australia/Europe and Indonesia? More service? Less service? Is good customer service a necessary part of successful business dealings? Are there a lot of foreign expats in Indonesia? Where do expats live in Indonesia? Where do expats hang out in Indonesia? What are some good books that describe the life and culture of Indonesia? What are some good internet resources that help describe life in Indonesia? Summarize the business mindset of people in Indonesia. Ruthless? By-the-book? Improvisational? Considerate? Are there any particular business dealings that foreigners should not get involved in? Foreigners sometimes don’t understand the Asian concept of “face” (dignity / prestige). How would you explain “face”? How is “face” (dignity / prestige) a part of Indonesia business culture? Give examples. Give examples of direct (saying exactly what is meant) versus indirect (gestures, avoidance, vague language) communication style in Indonesia. Is direct communication (saying exactly what is meant) considered rude? How can someone understand the meaning behind indirect communication? Any hints to help translate? People used to very direct communication find it hard to understand when someone with a more indirect communication style has told them “yes” or “no”. Give examples of some indirect statements that actually mean “yes”, and indirect statements that actually mean “no”. How important is hierarchy in business in Indonesia? Is it disrespectful for a foreigner to deal in business with a certain class of people? Give an example of a business situation where the norms of hierarchy are not followed, (by a foreigner who doesn’t understand), and explain how they should be followed according to the norms of Indonesia. When a foreigner wants to do business with a Indonesia company, who should they contact? Go directly to the top? Start in the middle? Are personal recommendations important in doing business with new companies or can they be reached purely on a basis of business? What is the general attitude of businesses in Indonesia towards foreigners coming to Indonesia to do business? What are some social etiquette actions that show respect for someone? What are some social actions that would be taken as disrespectful? How do people in Indonesia express anger? Do they usually stay quiet or express their feelings openly? How do people view laughter in Indonesia? What kinds of jokes are not acceptable? How can a foreigner doing business in Indonesia build trust with local businesses or people? Is it important to make local friends in order to spread your business? How important are business cards (name cards) in Indonesia? Do most people have them? What is the standard business card format in Indonesia? What information goes on it? Bi-lingual with one language on each side? Are there proper manners for how to give your business card to someone, and how to receive someone’s card? Give some insight and advice about business negotiations in Indonesia. How can you tell that a person is successful? Clothing? Manners? Neighborhood? Events? Friends? Do you feel that business is Indonesia is attracted to innovation, or attracted to the status quo? Is there a stigma against business people that are just passing through Indonesia, looking for opportunities, versus foreigners who live there? What advantages do foreigners who live full-time in Indonesia have over those who just visit? What advantages do foreigners have (versus locals) when doing business in Indonesia? What advantages do local people have (versus foreigners) when doing business in Indonesia? What are the top risks of doing business in Indonesia? How involved is the government in the dealings of small business? Is the government of Indonesia open to foreign businesses or restrictive? What government departments will a small business probably need to interact with? Please describe each. What are some government regulations that need to be considered by foreign businesses? What sectors is the government emphasizing development now? Any current mission or push? What government incentives are available to new or small businesses now? Do many small businesses use government incentives? What government grants are available to new or small businesses now? Do many small businesses use government grants? How does Indonesia rank on the “Ease of Doing Business” index? What’s the hardest part about doing business in Indonesia? What’s the easiest part about doing business in Indonesia? If a foreigner is starting a business in Indonesia, is it required to have a local partner? Or does the government allow foreign-controlled businesses? What are the advantages and disadvantages of each kind of business structure in Indonesia? Any advice on naming a business in Indonesia? Are English names OK, or should they be localized? What are some mistakes that foreign businesses have made when naming a business in Indonesia? How long does it generally take to incorporate a business structure in Indonesia? How does a foreigner create a business structure in Indonesia? How should a new business decide where to locate in Indonesia? How much does it cost to rent a typical 4-person office space in Indonesia? Give a range from center-city expensive to outlying-area cheap. Can a foreign investor easily buy property for business in Indonesia or renting is the only option? What are the advantages and disadvantages of locating a new business in the big city versus the outlying areas? Does business location (center of biggest city versus outlying areas) communicate something about the business itself? Which neighborhood or street has the most prestige? How can a new office get set up with electricity, internet, phone, and other important utilities? Describe the utility companies and summary of process for each. Will a foreigner have a problem getting utilities for the business? If so, what solution would you recommend? How can a new business find out which permits are necessary to do their business? How can a new business get all the permits they need? Are contracts respected in Indonesia? Or are they often ignored if need be? Which lawyers or law firms are best to help foreign entrepreneurs in Indonesia? Which accountants or accountancy firms are best to help foreign entrepreneurs in Indonesia? What are the current tax rates for businesses in Indonesia? Are the taxes different in different regions in Indonesia? How do business owners pay their taxes? Besides paying taxes, what ongoing maintenance bureaucracy is required by the government for small businesses? What books describe doing business in Indonesia? What internet resources help someone doing business in Indonesia? What are the main strengths of the local talent in Indonesia? Any particular skills or fields more developed or emphasized? What is the best way to hire local employees? How to find good people? What’s the best way to find and hire exceptionally smart and talented workers in Indonesia? How much of the finding and hiring of employees is done online? Is it rare or common to have job openings posted online? What websites do people use for posting jobs / finding jobs / hiring employees? How can a Indonesia business hire a foreign employee? What are the requirements, steps, costs, and time? What processes or documents are required for hiring an employee? Give a summary of the most important labor laws in Indonesia - that a small-business employer should know. What processes or documents are required for paying an employee? Do taxes need to be withheld or paid? Any ongoing forms to file? Are there labor unions in Indonesia that will affect employees of small business? What processes or documents are required for firing an employee? What local companies or people can help with hiring? Give an overview of the availability and quality of small-business banking in Indonesia. Compare the top three choices for small business banking in Indonesia. Funds required? Costs? Online access? Visa/Mastercard debit card given? What requirements do the banks have for opening a business account? Any additional requirements for a foreigner to open a business bank account? How much of banking can be done online? Outgoing payments? International wires (telegraphic transfer)? What is the usual way for a business to pay employees in Indonesia? What payment method and how often? What is the usual way for a business to pay vendors in Indonesia? Bank transfer? Paper check? Visa/Mastercard? How can a small business get a bank loan in Indonesia? How can a small business get investors in Indonesia? What legal procedures should be followed to ensure that customers pay as promised? If customers don’t pay, what methods are used to get them to pay? What are the main exports of Indonesia? What industries are very well-developed in Indonesia? What industries are not very well-developed in Indonesia, and have much room to grow? What useful services or products are missing in Indonesia now? What industries have the most opportunity in Indonesia right now? What services or products are unique to Indonesia? Any particular business or service that exists in Indonesia, that you’ve never heard of anywhere else? What methods do local businesses use for marketing their business? What language should local marketing use? Do many businesses in Indonesia expand outside the country? What are the best ways to sell local products from Indonesia to other countries? Are there any government regulations concerning exports? What are some of the ways to open a franchise in Indonesia? Can investors transfer their existing business in Indonesia?